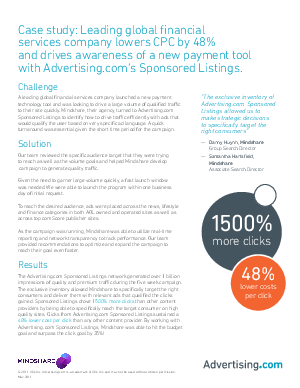 A leading financial services company launched a new payment technology tool and was looking to drive a large volume of qualified traffic to their site quickly. Their agency, Mindshare, turned to Advertising.com Sponsored Listings. The ASL network drove 1500% more clicks than other content providers and provided a 48% lower cost per click than any other. Fill out the form below to download the full case study.